After testing it for more than a year, YouTube is finally letting users opt for the Material Design version on the desktop. The Google-owned website says that it has resorted to material design for bringing uniformity across all the platforms – same experience on both mobile and desktop versions of YouTube. 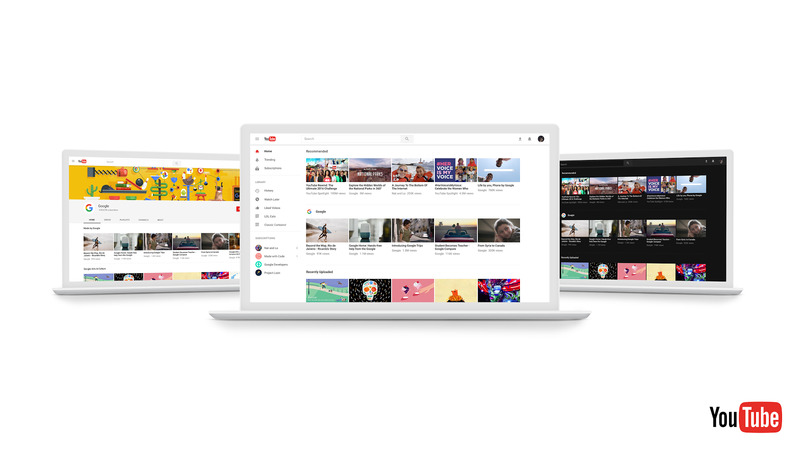 YouTube’s new design for desktop brings features such as endless scrolling, complete user profile banner, and a larger featured video on the profile page. The best part is that now you have “Dark Theme” option for the website that can be activated by clicking on the user icon and toggling the Dark Theme option to the right. This theme brings the dark color scheme for the light surfaces of the page, which acts as an ideal setup for night browsing. The new version also brings redesign for the “Theatre mode” on videos. When in Theatre mode, the search bar also turns dark for complimenting the dark color background in the mode. The site design is built on a new, faster framework named Polymer, which enables quicker feature development from here on out. And today, we are introducing one of the first new features developed on Polymer: Dark Theme. Developed to cut down on glare and let you take in the true colors of the videos you watch, Dark Theme turns your background dark throughout your entire YouTube experience. The preview for the new YouTube is open for all users globally, but it might not appear for everyone. Also, once YouTube gets enough preview users, it may close down further entries in order to maintain better monitoring of user feedback for the new version. You can head to YouTube.com/new for opting in for the redesigned version of the website. In case you do not like the new version of the website, you can always head back to the old version by clicking on your user profile and clicking on “Restore classic YouTube”. After selecting the option, YouTube will ask you the reason for restoring the old version. You will also get “I prefer not to answer” as a reason that will just take you to the old version without diving deep for your feedback.